It might be a site certification program, a course in economic development for community officials or a watershed infrastructure mega-project from colleagues on the operations side. However the top US utility economic development teams pursue their sales work, they excel at laying the groundwork. They marshal all facets of their territories and companies toward the ultimate goal — prosperity for their regions. They have a keen sense of what companies are looking for. Then they move without the ball, so that when the moment arrives, they can execute on the opportunity opening up before them. This year’s top utility economic development teams know they’re part of something bigger than themselves. 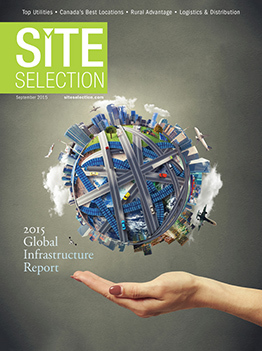 Each year Site Selection salutes the top utility economic development teams in the US. Chief among the criteria is analysis of corporate end-user project activity in 2014 in those utilities’ territories, based on data from Site Selection’s New Plant Database and from utility and community reports. Other criteria include website tools and data; innovative programs and incentives for business, including energy efficiency and renewable energy programs; and the utility’s own job-creating infrastructure and facility investment trends. Serving 9.4 million people in Greater Chicago, ComEd’s economic development team not only had direct influence on a number of projects (including five data centers) in 2014, but its involvement with nearly 20 economic development organizations meant the utility’s financial, thought leadership and board presence helped those EDCs back the creation of 21,821 new jobs across Northern Illinois, connected to more than $3 billion in investment and more than 23 million sq. ft. (2.1 million sq. m.) of new or expanded facilities. World Business Chicago honored Exelon/ComEd with its “Partner of the Year” award. Internally, the utility will be training 4,000 employees a year at its new training center now under construction. Record reliability metrics attained over the past two years are due in part to ComEd’s $2.6-billion, 10-year smart grid initiative known as the Energy Infrastructure Modernization Act (EIMA), which supported 3,600 jobs and helped customers avoid 1.2 million outages. In 2014, ComEd and its EDO partners conducted 423 retention visits representing several thousand existing jobs, and addressing business needs and concerns such as condition of streets and roads, workforce and training, and access to capital. Dominion’s team helped bring to fruition more than $2.7 billion in corporate facility investments supporting 3,615 new jobs. In addition to its continually growing lists of data centers and potential sites for more data centers, Dominion continued in 2014 to pursue renewable energy alternatives, announcing 400 MW of new solar generation to be added to the system; an offshore wind pilot project; a solar partnership program with large customers such as Capital One, Canon and Philip Morris; and a solar purchase program. As a corporate actor itself, Dominion also is a partner (along with Duke, Piedmont Natural Gas and AGL Resources) in supporting the proposed Atlantic Coast Pipeline, which consultancy ICF International said could create up to 2,200 new full-time jobs to North Carolina and Virginia because of the lower energy prices it would bring to the region. The pipeline, valued at up to $5 billion, would run approximately 550 miles (885 km.) from Harrison County, W. Va., to Robeson County, N.C. with an extension to Chesapeake, Va. Subsidiaries of all four partners and Public Service of North Carolina have signed on for service from the pipeline. Across a six-state territory that encompasses 7.3 million customers and an overall population of 22 million, Duke’s team supported nearly $3.6 billion of corporate investment via 85 project wins (including 28 expansions) that will create more than 11,400 jobs. North Carolina led the way in number of projects (37) and jobs (4,111), while South Carolina led in cumulative project investment, at nearly $1.6 billion. Investors included Walmart, Colgate-Palmolive, Toray Industries, GKN Driveline, Gildan Yarns, Purdue Pharmaceutical, GE Aviation, eBay, Amazon and DaVita Labs. Enhancements to the team’s offering included supplementing its Site Readiness Program with industry-specific site certifications; consulting assignments to assist communities in identifying strengths and weaknesses; and expansion of business recruitment/lead generation efforts. Duke’s Site Readiness Program has evaluated 165 sites since 2005 (landing 24 projects worth nearly $3.6 billion along the way), and plans to add 24 new sites in 2015. The Entergy team helped bring a cumulative $14.4 billion of corporate project investment and 7,200 new jobs to a population of more than 6.7 million in its 2.8-million-customer territory in Louisiana, Texas, Mississippi and Arkansas last year, including projects from Yuhuang Chemical, Calbee and Jefferson Gulf Coast Energy Partners. Arkansas led in job creation with 2,365, followed by Louisiana with 1,920. Louisiana dwarfed all other states with more than $12 billion in investment. The company completed its first full calendar year of its system-wide economic development initiatives, including the formation and growth of a Corporate Business and Economic Development Department to augment and support the teams already delivering results in each state. Major chemical industry investment along the Gulf Coast was part of why Entergy saw industrial sales grow by 5 percent for six consecutive quarters through the end of 2014. The team’s suite of services and tools includes large project services (which supported 84 proposed electric load additions over 5 MW); contract, rate and tariff services; and a GIS-based Strategic Sites Initiative to support the Entergy Certified Sites Program with suitability analysis. A new target industry study defined seven core sectors and four niche sectors, which helped the team reach out to 755 new qualified prospects and 300 existing customers. A population of 13.4 million in FirstEnergy’s six-state territory welcomed nearly $2.2 billion in corporate project investment that the utility’s economic development teams at 10 regulated distribution companies helped bring across the finish line, supporting the creation of 6,080 new jobs. In addition to continuing to improve the data in its FirstProspector site search tool, the FirstEnergy team last year launched a shale task force, and partnered with state and institutional partners including Penn State University, state EDOs, and the Electric Power Research Institute, among others, to promote opportunities in such fields as data centers, life sciences, medical devices and additive manufacturing. Shale territory in Ohio, West Virginia and Pennsylvania was a prominent recipient of the utility’s total spend of more than $1.3 billion in 2014 on transmission build-out. Cultivating $1.3 billion in corporate facility investment that brings with it 11,370 new jobs, FPL’s team continued to serve its territory’s population of more than 13.6 million by launching three new programs: PoweringFlorida Illumination events, a data center recruitment program (see sidebar) and its Strategic Sites Inventory (SSI). The bi-annual, two-day Illumination events connect economic developers with site selectors and corporate real estate leaders from around the nation. So far the events have yielded nine return visits by consultants accompanied by corporate clients looking for sites. SSI is an analytical process for identifying parcels of land most suited for industrial or business park development, and is initially being implemented in 19 counties. On the renewables side, before the end of 2016, FPL intends to triple the amount of solar energy it uses to serve its 4.8 million customers, including three new PV power plants. Georgia Power’s economic development team last year helped bring $2.1 billion in corporate investment supporting 16,575 new jobs to its state, packaged in 81 projects from the likes of Surya, State Farm, Acuity Brands, Keurig Green Mountain and Chime Solutions. The Community & Economic Development team’s new structure is the result of a strategic planning process that began in 2012. Community Development, formerly operating as two separate groups for non-metro and metro support, is now under one manager, and Engineering, Research and Georgia Resource Center staffs were combined to form a new Support Services group. In 2014, C&ED implemented an automated process that scans the organization’s online site database, identifies records that have not been updated within the last year, and communicates to site contacts to check accuracy of data. The team also began to focus on downtown revitalization across the state, as well as a new Georgia Power Leads Council and customer intelligence portal to encourage an “all hands on deck for economic development” process across all functions of the company. And a new grant program was launched to help communities perform due diligence on candidates for the utility’s Business Ready Sites program. More than $607 million in corporate facility investment that will create 3,155 new jobs came to Hoosier Energy territory in 2014, including projects from Valeo, GPC, Boar’s Head, TOA, Cummins and Casey’s General Stores. Hoosier Energy’s Economic Development team last year helped bring to fruition 128 Commercial/Industrial (C&I) energy efficiency projects saving over 11,000 megawatt-hours; established a new five-year discounted economic development rate; developed simplified economic impact software to assist in determining ROI for C&I projects; updated their website to improve functionality and usability; developed a new Web-based labor availability portal; expanded a workers’ compensation portal for more state-to-state comparisons; updated their property tax abatement estimator; and shared economic impact software with local and regional EDOs. Out of South Carolina’s top 10 job-creating companies, 50 percent of the companies were in SC Power Team service territory, investing more than $924 million and creating 8,381 new jobs across a territory with a total population of 2.5 million. Multiple staff members beefed up the SC Power Team as it adopted a holistic approach to fostering projects through the entire site selection process. A new website, data tools and GIS system are rolling out this year. In 2014, the SC Power Team Board of Trustees and Santee Cooper Board of Directors approved the establishment of a $30-million Site Readiness Fund that directs, via matching, more than $60 million to advance sites within SC Power Team territory. The 2014 SRF advancements occurred at five sites in Calhoun Sumter, Orangeburg, York and Clarendon counties. Santee Cooper and the 20 electric cooperatives adopted a new rate structure and incentive program, making their power system one of the lowest cost and most reliable utilities in the nation. Additionally, a new industrial incentive rate, which includes that rider, was adopted in 2014 for companies that meet certain capital investment or job creation requirements and have a minimum load of 2 MW. “This level of competiveness has allowed our system to win deals beginning in May 2014 against the other ‘powerhouse’ utilities,” says James Chavez, president and CEO. TVA Economic Development achieved a banner year in 2014 by attracting and retaining more than 60,300 jobs and $8.5 billion in business investments in the Valley, where 9 million people live in seven states. Investors included Hankook Tire, VW, Fresenius, Remington Arms, Beretta and Unilever. Product development was an important focus for the region in 2014. The InvestPrep™ program, a non-certification community readiness program designed to enhance marketability of sites and buildings, came on the heels of the 10th anniversary of TVA’s innovative Megasites program and is already proving successful, attracting four companies, 500 jobs and $86.3 million investment in round one. In addition to the third Rural Leadership Institute to train 20 economic development professionals, TVA Economic Development also created a new Rural Economic Development Cabinet as a seven-member “think tank” about topics within rural communities. TVA Community Development entered its second year with its Valley Sustainable Communities Program. And TVA staff worked with more than 160 communities that were interested in establishing or expanding their retail development programs and strategies through TVA’s Retail Development Assistance Program. TVA Economic Development has been named by the Nashville Business Journal as one of “Nashville’s Best Places to Work” for its size category for two years in a row.